Kolíčky západky pro boční výklopná okna zadní pár. 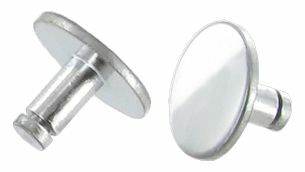 Pop out latch mounting pins pair. Pop out final assembly parts, most of the pop-out locks are supplied without mounting materials. In most cases, these parts just as hard to replace as the locks themselves, it is therefore advisable immediately to order it. If your old locks still in good condition this is often not the case with assembly parts, which is also the main reason that these are not included. at the locks. Chromovaná západka výklopného okna (knoflík slonová kost) zadní pravá.